They are directly affected when the elephant goes on rampage – i.e. the risk eventuates. This post discusses reasons why these metaphorical pachyderms are ignored by those who need most to recognize their existence . 1. Let sleeping elephants lie: This is a situation in which stakeholders are aware of the risk, but don’t do anything about it in the hope that it will not eventuate. Consequently, they have no idea how to handle it if it does. Unfortunately, as Murphy assures us, sleeping elephants will wake at the most inconvenient moment. 2. It’s not my elephant: This is a situation where no one is willing to take responsibility for managing the risk. This game of “pass the elephant” is resolved by handing charge of the elephant to a reluctant mahout. 3. Deny the elephant’s existence: This often manifests itself as a case of collective (and wilful) blindness to obvious risks. No one acknowledges the risk, perhaps out of fear of that they will be handed responsibility for it (see point 2 above). 4. The elephant has powerful friends: This is a pathological situation where some stakeholders (often those with clout) actually increase the likelihood of a risk through bad decisions. A common example of this is the imposition of arbitrary deadlines, based on fantasy rather than fact. 5. The elephant might get up and walk away: This is wishful thinking, where the team assumes that the risk will magically disappear. This is the “hope and pray” method of risk management, quite common in some circles. 6. The elephant’s not an elephant: This is a situation where a risk is mistaken for an opportunity. Yes, this does happen. An example is when a new technology is used on a project: some team members may see it as an opportunity, but in reality it may pose a risk. 7. The elephant’s dead: This is exemplified by the response, “that is no longer a problem,” when asked about the status of a risk. The danger in these situations is that the elephant may only be fast asleep, not dead. Risks that are ignored are the metaphorical pachyderms in the room. Ignoring them is easy because it involves no effort whatsoever. However, it is a strategy that is fraught with danger because once these risks eventuate, they can – like those apparently invisible elephants – run amok and wreak havoc on projects. Over the last few weeks, it has been raining quite a bit in Sydney. Last weekend I took advantage of a break in the rain and went bushwalking in the Lane Cove National Park with a friend. The park lies along the Lane Cove River – a picturesque little waterway that runs through suburban Sydney. The track we walked along was a bit slippery from the rain of the previous weeks but was drying out nicely in the morning sun. One of the consequences of sunny weather after a long spell of rain is that reptiles tend to seek open spaces to soak in some sun. With dense vegetation on either side, the open, rocky areas on the track were inviting spots for reptiles looking to sunbathe. I thought we might see snake or two but we didn’t. Instead we walked into a number of Eastern Water Dragons, semi-aquatic lizards that are common in eastern Australia (see Figure 1). Incidentally, fully-grown water dragons are a pretty impressive sight, growing up to a metre in length. They are also quite well camouflaged, black stripes over a grey-brown coat that merges nicely with the rock-and-mud colours of the track. When a water dragon sunbathes, it stays still, rock-like, for long periods of time. This makes sense from a safety perspective: motion might attract the attention of predators (mainly omnivorous native birds such as Currawongs and Kookaburras). So the reptile remains statue-like, perfectly camouflaged by colours that merge with the ground it lies on…until a blundering bushwalker disturbs its repose, like we did many times (to many lizards) last weekend. At that point the creature has two options: to freeze (maintain the status quo) or to flee (turn tail and scuttle off). The water dragon senses approaching bushwalkers by the disturbance caused by their footfalls along the trail, further amplified by the crackling of leaves and brush that come underfoot. To the water dragon, the approaching footfalls signify an unknown: it could be benign but could also be a predator on the prowl. It is safest to assume the latter because if the lizard chooses the former wrongly it could end up dead. However, even if it is a predator, it is quite possible that the lizards’s superb camouflage will do its job and render it unnoticeable. (Besides, it is comfortable out there in the sun, so there’s an understandable reluctance to move.) 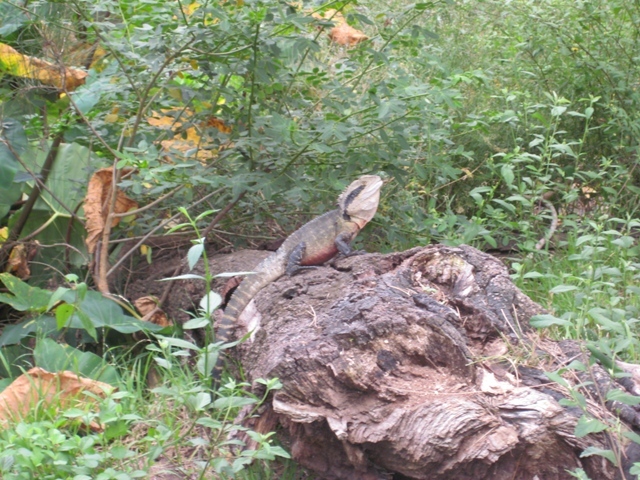 Consequently, the first reaction of the lizard is to continue its statue-like stance, but remain alert to the danger. As the footsteps get closer it reassesses the situation continually, deciding whether to run for it or stay put. At some point, a threshold is reached and the lizard dashes off into the undergrowth (or a stream, if there’s one handy – water dragons are good swimmers). Now, if there were no blundering bushwalker, the dragon would presumably continue basking in the sun undisturbed. The bushwalker changes the lizard’s environment and the lizard reacts to this change in one of the two ways it knows – it stays put (does nothing) or runs (takes evasive action). Both actions are aimed at self-preservation – we can take it as given that the lizard does not want to be a lizard-eater’s lunch! The first action has the benefit of not expending energy unnecessarily, but could lead to an unpleasant end. The second is a better guarantor of safety but involves some effort. There is a tradeoff: not becoming lunch involves understanding that there is no such thing as a free lunch. The interesting thing is that the threshold seems to vary from dragon to dragon. When I used the phrase “walking into” earlier in this piece, I meant it quite literally: many times we didn’t notice a recumbent reptile until we were almost upon it. At other times, though, a startled slinker would speed off when we were several metres away. It seems some water dragons scare easily while others don’t. In either case, the lizard makes an assessment of the situation based on the information gleaned through its senses and then decides on a course of action. The implications for management are the following: since the above is pretty much a guaranteed first reaction from those affected, change management initiatives need to address it upfront. This isn’t the same as the “what’s in it for me” (or WIIFM) factor – it is more basic than that – it is the loss of the familiar world. What is needed is reassurance that the changes are benign – or even better, beneficial – to those affected. On the other hand, if there are going to be negative consequences, then it is best to state – early in the process – that people’s work conditions (or employment) are under threat. In this case folks know exactly what’s coming and can make their own plans to deal with it. Unfortunately, this kind of honesty is rare – organisations seem to prefer to keep their employees stumbling around in a fog of uncertainty. I’ve written a number of articles on project failure, covering topics ranging from definitions of success to the role of biases in project failure. As interesting as these issues are, they are somewhat removed from the day-to-day concerns of a project manager who is more interested in avoiding failure than defining or analyzing it. In a paper entitled, Early warning signs of IT project failure: the dominant dozen, Leon Kappelman et. al. outline the top twelve risks associated with IT project failures. This post summarises the paper and lists the top twelve signs of impending trouble on projects. The research team first searched the literature extensively to develop a preliminary list of early warning signs (EWSs). The two authors experienced in IT project management then added several EWSs based on their personal experience. Next, 19 IT project management experts were asked to assess the list. On the basis of their feedback, we added new items and modified others to develop a list of 53 EWSs. Finally, the research team invited 138 experienced IT project managers (including the original 19 experts) to participate in rating the 53 EWSs using a scale from 1 (extremely unimportant) to 7 (extremely important). Fifty-five (55) of these managers completed the survey, yielding a response rate of nearly 40 percent. The respondents had an average of more than 15 years of IT project management experience. The budgets of the largest IT projects they managed ranged from 3 million to 7 billion dollars. About 30 percent held the title of program or project manager and nearly 20 percent had consultant titles. Director or program analyst titles accounted for about 15 percent each, 10 percent were vice presidents, and the rest held titles such as CEO, CIO, chief scientist, chief technologist, or partner. Although the list and the rankings were based on the subjective opinions of experts, the large number of participants ensures a degree of consensus regarding the most important factors. No documented milestone deliverables and due dates. were combined into: ineffective schedule planning and/or management. This process of combining the top 17 items resulted in twelve risks, half of which turned out to be people-related and the other half process-related. I discuss each of the risks in detail below. 1. Lack of top management support: This was the number one risk out of the fifty three that the authors listed. This isn’t surprising – a project that lacks executive support is unlikely to get the financial, material or human resources necessary to make it happen. 2. Ineffective project manager: Project managers who lack the communication and managerial skills needed to move the project ahead pose a serious risk to projects. The authors point out that this is a common risk on IT projects because project managers are often technical folks who have been promoted to managers. As such they may lack the interest, aptitude and/or skills to manage projects. Interestingly, the authors do not comment on the converse problem – whether the project manager’s lack of technical/domain knowledge contributes to project failure. 3. No stakeholder involvement and/or participation: A large number of projects proceed with minimal involvement of key stakeholders. Such folks often lose interest in projects when more immediate matters consume their attention. In such situations a project manager may find it hard to get the resources he or she needs to get the project done. Stakeholder or sponsor apathy is an obvious warning sign that a project is headed for trouble. 4. Uncommitted project team: The commitment (preferably, full-time) of a team is essential for the success of a project. Management needs to ensure that team members are given the time (and incentives) to work on the project. A point that is often left unconsidered is the intrinsic motivation of the team – see this post for a detailed discussion of motivation in project management. 5. Lack of technical knowledge/skills: Project teams need to have the technical skills and knowledge that is relevant to the project. Managers sometimes wrongly assume that project staff can pick up the required skills whilst working on a project. Another common management misconception is that project personnel can master new technologies solely by attending training courses. Getting contractors to do the work is one solution to the problem. However, the best option is to give the team enough time to get familiar with the technology prior to the project or, failing this, to switch to a technology that the team is familiar with. 6. Subject matter experts are not available: It is often assumed that subject matter experts can provide adequate inputs into projects whilst doing their regular jobs. This seldom works – when there’s a choice between the project and their jobs, the latter always wins. Project sponsors need to ensure that subject matter experts are freed up to work on the project. 1. Unclear scope: The authors label this one as “Lack of documented requirements and/or success criteria.” However I think it is better described by the phrase I’ve used. All project management methodologies emphasise the importance of clear, well-documented requirements and success criteria – and with good reason too. Lack of clarity regarding project scope means that no one knows where the project is headed – a sure sign of trouble ahead. 2. No change control process: As the cliché reminds us, change is the only constant in business environments. It is therefore inevitable that project scope will change. Changes to scope –however minor they may seem- need to be assessed for their impact on the project. The effect of several small (unanalyzed) scope changes on the project schedule should not be underestimated! Many project managers have a hard time pushing back on scope changes foisted on them by senior executives. Hence it is important that the change control process applies across the board – to everyone regardless of their authority. 3. Ineffective scheduling and schedule management: Many schedules are built on little more than guesswork and an unhealthy dose of optimism, often because they are drawn up without input from the folks who’ll actually do the work (see my article on estimation errors for more on this). Schedules need to be rooted in reality. For this to happen, they must be based on reliable estimates, preferably from those responsible for creating the deliverables. Once the schedule is created, it is the project manager’s responsibility to update it continually, reflecting all the detours and road-bumps that have occurred along the way. A common failing is that time overruns are not properly recorded, leading to a false illusion of progress. 4. Communication breakdown: Project communication is the art of getting people on the same page when they are reading different books. In my post on obstacles to project communication, I have discussed some generic difficulties posed by differences in stakeholder backgrounds and world-views. One of the key responsibilities of a project manager is to ensure that everyone on the project has a shared understanding of the project goals and shared commitment to achieving them. This is as true in the middle or the end of a project as it is at the start. 5. Resources assigned to another project: In my experience resources are rarely reassigned wholesale to other projects. What usualy happens is that they are reassigned on a part time basis, as in “we’ll take 20 % of Matt’s time and 10% of Nick’s time.” The problem with this is that Matt and Nick will end up spending most of their time on the other project, leaving the one on hand bereft. 6. No business case: A not uncommon refrain in corporate hallways is, “Why are we doing this project?” No project should be given the go-ahead without a well-articulated business case. Further still, since an understanding reason(s) for doing the project are central to its success, these should be made available to every stakeholder: a shared understanding of the goals of the project is a prerequisite to a shared understanding of the rationale behind it. I’m sure there aren’t any surprises in this list – most project managers would agree that these are indeed common (and often ignored) early warning signs of failure. However, I suspect that there will be substantial differences of opinion regarding their ranking. Wisely, the authors have refrained from attempting to rank the risks – the list is not in order of importance. Good projects managers anticipate potential problems and take action to avoid them. Although the risks listed above are indeed obvious , they are often ignored. Affected projects then limp on to oblivion because those responsible failed to react to portents of trouble. Granted, it can be hard to see problems from within the system, particularly when the system is a high-pressure project. That’s where such lists are useful: they can warn the project manager of potential trouble ahead.